I am seriously in love with my Instant Pot. This thing is a monster machine. I had a potluck dinner to bring a dish for this weekend, which was a really great excuse to try out the pot. I was keen to try out oxtail stew but there was a surprising dearth of oxtail stew recipes for pressure cookers. 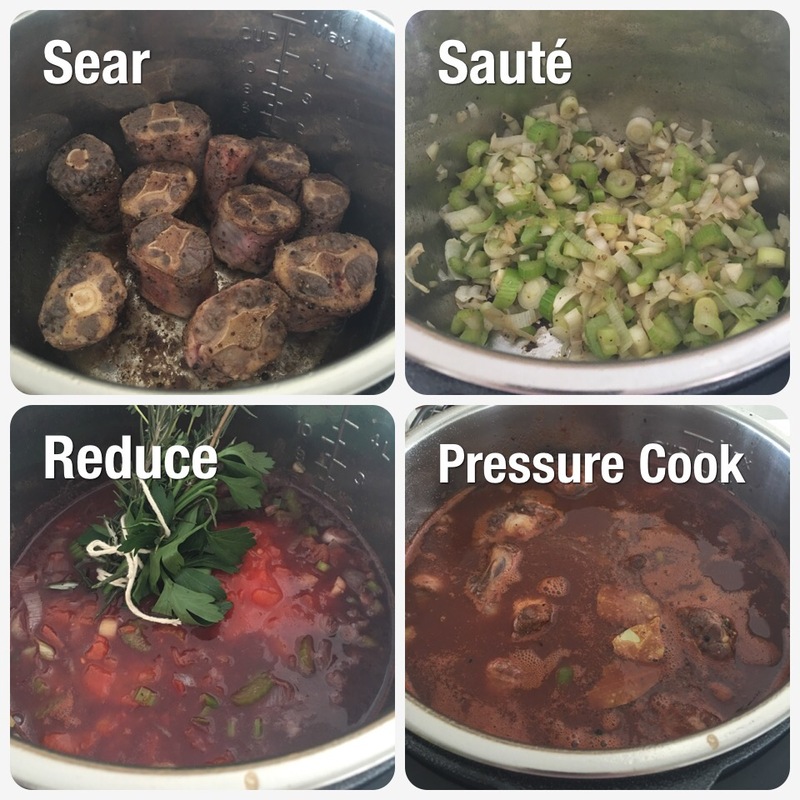 The challenge of making oxtail stew in closed cookers like pressure cooker are mainly that the cooking liquid that braises the oxtail does not reduce. Cooking over the stove naturally reduces the liquid. In the past when I have cooked over the stove I had achieved a level of “fall off the bone” doneness but it always seemed a tad too soft for me. What I liked about the Instant Pot was that the oxtail was perfectly done, tender consistency but just the right amount of bite to get you wanting to use your hands to make sure you can angle the piece to gnaw the meat off! So I did spend an inordinate amount of time in the week figuring out how to get the right thickness of sauce for the oxtail. 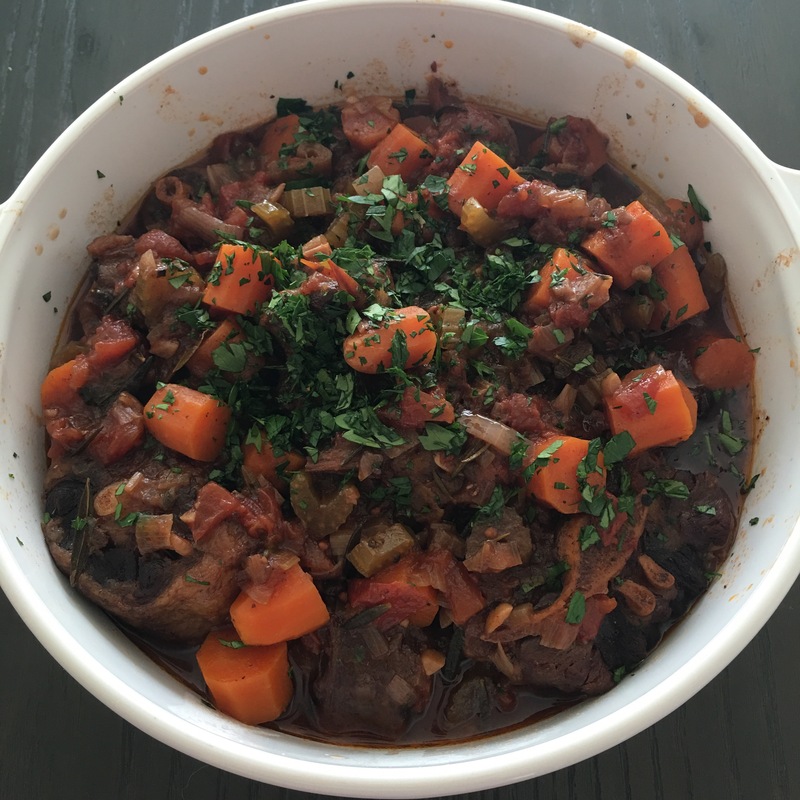 I adapted a recipe from NY Times for wine braised oxtails but with substantial changes to adapt the recipe for the Instant Pot. For example I used way less wine. Although later when the potluck dinner discussion veered into a heated discussion about whether one should wear a bra to sleep or not (!) I was wondering if I had put in a wee bit too much wine. I also added the vegetables that I liked but reserving the carrots to pressure cook in a separate final step so that the carrots still retained their form and didn’t melt into the sauce. Finally to make sure that the stew was thickened, I used xanthan gum as a low carb thickener. The whole dish is cooked in stages in the Instant Pot – sauté the pieces of meat first, followed by the vegetables, briefly simmering then finally pressure cooking the meat and sauce. And so here I am spending the rest of the weekend patting my own back vigorously for a successful experiment. Some may think it takes too many steps still but I think it’s well worth it for the intense depth of flavour and the contrast of textures. I love you Instant Pot that the oxtails are not a gummy mass but a beautiful rich meat stew. 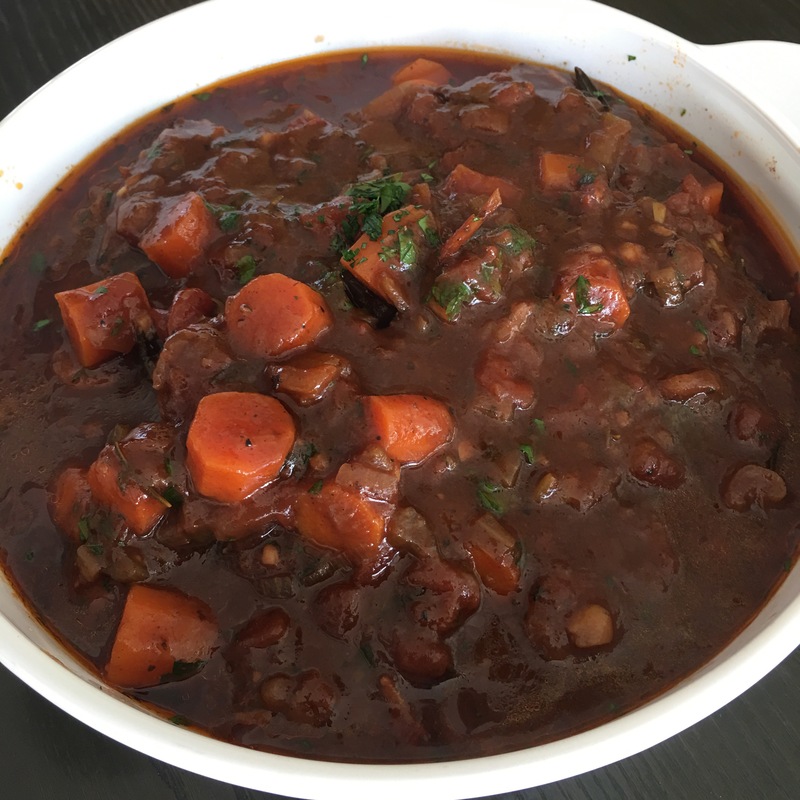 Final view of the stew – a thick rich dark gravy. Tie the rosemary, thyme, parsley in a bunch with kitchen twine. Coat the oxtail pieces with 2 tsp salt, 2 tsp pepper and 1/2 tsp ground pepper and ground allspice. Put the instant pot into sauté mode and put the olive oil in the pot. Sear the oxtail pieces on all sides till browned. Set aside. Sauté the vegetables – garlic, leek, onions and celery till wilted and slightly caramelized. Add in the Balsalmic vinegar, wine, Worcestershire sauce, chicken stock, tomatoes in the sauce as well as the tomato paste. Add the herb bundle. Simmer for about 5 minutes to mix in. Stir and make sure the browned bits at the bottom of the pot are dislodged. Put the oxtail pieces into the pot, carefully immersing all the pieces. Put the Instant Pot into “meat” pressure cooker mode. This will cook 35 minutes. At the end of the cooking, allow natural pressure release. Remove the oxtails from the pot. Add the carrots in and put the Instant Pot into manual pressure cooker mode for 10 minutes. Allow natural pressure release. Open the pot and remove the carrots and plate together with the oxtails. Set the Instant Pot on sauté mode again and reduce the sauce. Sprinkle the xantham gum over the sauce and stir well. Reduce the sauce for about 10 minutes. Pour the sauce over the oxtails and carrots. Add the chopped parsley and serve hot. This is awesome over mashed cauliflower purée. When is the Worcestershire sauce and the Allspice added? Hi Daniel, thanks for the heads up. I’ve amended the recipe. The Worcestershire sauce goes together with the balsamic vinegar. And the allspice goes together with the salt and pepper in the browning of the oxtail. I don’t think flour and cornstarch is really low carb friendly…when I first went on this low carb journey I tried substitutes like arrowroot flour, but in the end I found that xanthan gum is really a wonderful substitute and only a little helps to thicken up stews well. It can even be used for puddings and thickened sauces. It’s pretty easy to find and I usually order the Bob’s Red Mill brand from iherb. Alternatively, your local baking supply shop may have xanthan gum too. I’m planning to make it this weekend, will probably just use my standard process for thickening which is, draw off about 1/4 cup of the cooking liquid into a measuring cup, add a few Tbsp. of cornstarch and whisk together until lumps are gone. Stir the whole thing into the remaining sauce and whisk until thickened. Why not do a manual pressure release for the oxtails, and then add the carrots without removing the oxtails from the pot? You would pressure cook everything for 10 more minutes and let the pressure naturally release. This would give the oxtails and carrots roughly the same amount of pressurized cooking as your original recipe called for, but saves about 10 minutes. Over cooking the oxtails will make them fall off the bone but I wanted a little chew to it. Thank you so very much for this recipe. It is incredible – a party in my mouth. I love oxtails and this is the first time my husband had them and he is in love with them because of this recipe. The whole house smells fabulous. I just finished dinner and can’t wait for the leftovers for tomorrow, that is always our sign of a GREAT meal. Thank you again. Wonderful! So glad that the recipe works for you! What size can of tomatoes? Two cans of chopped tomatoes is just a bit vague. LOL Here they come in 14 and 24 oz sizes. So, I made this and the flavor was amazing, but the meat was still too tough. I got Coming Under Pressure by Lorna Sass out of the library, and there’s a recipe on there that says to cook for 55 minutes on high pressure. Will try that next time. I’ve done the recipe quite a few times – and varied the cook times. At the moment I like 40-45 minutes for a nice balance of softness and a bit of chew. Thanks for your feedback though!